It may be surprising to learn that much remains unknown about radiation's effects on materials. To find answers, Massachusetts Institute of Technology (MIT) researchers are developing techniques to explore the microstructural evolution and degradation of materials exposed to radiation. One drawback with this testing method, affectionately known as "cook and look," is that it's slow. MIT researchers report a more dynamic option this week in Applied Physics Letters, to continuously monitor the properties of materials being exposed to radiation during the exposure. This provides real-time information about a material's microstructural evolution. "At MIT's Mesoscale Nuclear Materials Lab, we've been developing improvements to a technique called 'transient grating spectroscopy' (TGS), which is sensitive to both thermal transport and elastic properties of materials," said Cody Dennett, the paper's lead author and a doctoral candidate in nuclear science and engineering. "To use this type of method to monitor dynamic materials changes, we first needed to show—via developing and testing new optical configurations—that it's possible to measure material properties in a time-resolved manner." 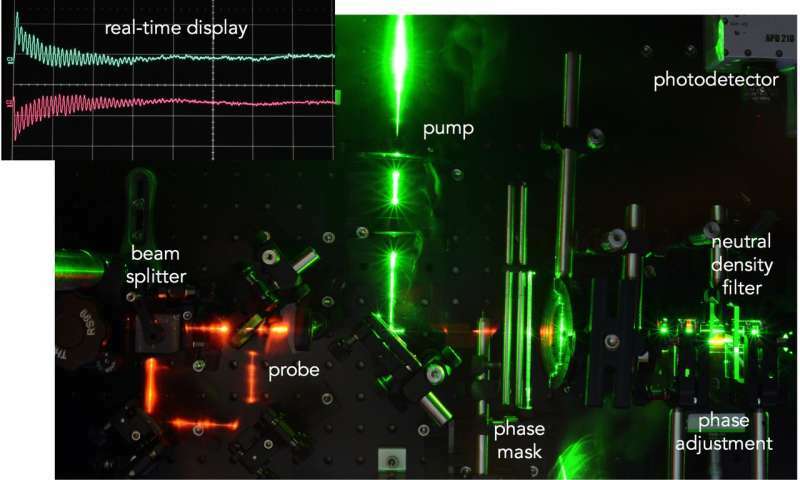 "By pulsing the surface of a sample with a periodic laser intensity pattern, we can induce a material excitation with a fixed wavelength," Dennett said. "These excitations manifest themselves in different ways in different systems, but the type of responses we observed for pure metallic materials are primarily standing surface acoustic waves." The approach is generally referred to as a transient grating technique. To help visualize this, Dennett offered the imagery of flicking a drumhead, but in this case, on a solid surface where the laser does the "flicking." The "drum's" response depends on the condition of its structure and can therefore reveal changes in structure. "These excitations' oscillation and decay are directly related to the material's thermal and elastic properties," Dennett said. "We can monitor these excitations by using the material excitations themselves as a diffraction grating for a probing laser. Specifically, we monitor the first-order diffraction of the probing laser because its intensity and oscillation directly reflect the amplitude and oscillation of the material excitation." The signal the researchers are trying to detect is very small so it must be amplified by spatially overlapping a reference laser beam that doesn't contain the signal of interest, which is a process called heterodyne amplification. "Most complete measurements are made by collecting multiple measurements at different heterodyne phases (a measure of the path length difference) between the signal and reference oscillator to remove any systematic noise," he said. "So we've added an additional probing laser path—in the same compact optical configuration—that allows us to collect measurements at multiple heterodyne phases concurrently." "Previously, complete measurements of this type required actuation between measurements at different heterodyne phases," he said. "With this method in hand, we're able to show that time-resolved measurements of elastic properties on dynamic materials are possible on short timescales." The group's experimental method is called Dual Heterodyne Phase Collection Transient Grating Spectroscopy (DH-TGS). It's a significant advance because it can be used for dynamically monitoring the evolution of material systems. "Our technique is sensitive to elastic and thermal transport properties, which may be indicative of microstructural changes within the material systems being monitored," Dennett said. It's also both nondestructive and noncontact, meaning that as long as optical access to a sample with sufficient surface quality is established, it can be used to monitor real-time property changes as a result of any "external forcing" such as temperature, voltage or irradiation. Because DH-TGS is a nondestructive material diagnostic, Dennett said there are many systems one might envision studying as microstructural evolution is taking place. "We're interested in the radiation damage case in particular, but other applications might include studying low-temperature phase change materials, or real-time monitoring of oxide layer formation on steel alloys," he said. "[W]e're trying to enable real-time, nondestructive monitoring of dynamic materials systems," said Dennett. "But another goal of ours is to disseminate the abilities of this type of methodology more widely. We have particular applications in mind for our next steps, but the relative ease of implementation should make it interesting to a wide range of materials scientists." "The work we presented in Applied Physics Letters was the last piece in the puzzle standing between us and realizing the overarching motivation for the project," Dennett said.